The Informal Grub’s social journey and my wellness journey began in January 2016 – 6 months after I was diagnosed with Ehlers Danlos Syndrome, Postural Orthostatic Tachycardia Syndrome and Mast Cell Activation Disorder. With a focus on healing, self-care, and full body wellness, The Informal Grub is a place where I post recipes, wellness tips, interesting health facts, healthy spots to eat around the country and full on truth talk. Passion turned profession, I am now getting my Masters in Clinical Nutrition at the University of Bridgeport to become a nutritionist. I graduate in April of 2020 and cannot wait to help others heal with whole foods, healing herbs and self-care routines. Follow along as I learn, heal, stumble and continue my search for wellness as I fight the daily struggles of my chronic illnesses. This site is filled with recipes, nutritional facts and awareness on what aids and ails me. Hopefully along the way, I can enhance the way you grub. After being diagnosed with a handful of rare syndromes and chronic illnesses, I’ve made it my mission to put my wellness first so that I could avoid being on disability and give myself a better future full of possibility. There is no cure for what ails me, so it’s a full-time job to ensure every decision I make is one that empowers and aids me to ensure I never get back to where I was. I love that I get to share my wellness journey and what I find along the way. 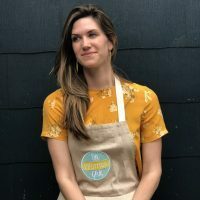 The purpose of The Informal Grub is to create a non-biased and diverse platform where people can come to find healing recipes, wellness, lifestyle, travel and food suggestions throughout Houston and surrounding cities + states, as well as honest and true collaboration with wonderful individuals and businesses. I enjoy working with individuals and businesses that share the same vision as me and embody that persona through and through. If I am presented with a product that I personally would not use, I will not promote the product – I want to create a page where people can trust my word and opinions on wellness. If you are interested in collaborating with me on a project, sponsored posts or would like to have me as a guest speaker, please send me an email with an idea, or just to say hi.